This isn’t inconsequential nattering, enunciated today and evaporated tomorrow. A-Sanaa in effect urged Israeli Arabs to take justice into their own hands – or what they claim to be justice. Tibi honed a fraudulent sense of victimhood and concomitantly the delegitimization of Israel as both criminal and racist. This follows countless provocative acts and statements, including junkets to Mideastern capitals where Israeli-Arab MKs unequivocally sided with the existential enemy of the state whose taxpayers foot their bills and in whose parliament they serve. The inflammatory oratory, moreover, willfully promotes a skewed version of the 2000 riots (which not incidentally coincided with the launching of Yasser Arafat’s intifada just then). Falsehoods are elevated to an axiomatic historiography when all mention is omitted of the fact that rampaging Israeli-Arabs besieged dozens of communities within Israel 12 years ago. A Jewish civilian, Bechor Zhan, driving south from Haifa, was killed by a rock that Jisr e-Zarka youths hurled at his car. Throughout the North, motorists were violently dragged from their vehicles, asked if they were Jews and forced to show their IDs to ascertain their ethnicity. This is what happened to Ya’acov Ben-Hamo of Kibbutz Beit Alfa when driving between Umm el-Fahm and Afula. Fifteen masked Arabs pulled him from his automobile, burned it and kicked him mercilessly. He was barely rescued by a passing bus driver. Adani was pelted with bricks and rocks and beaten to a pulp for being a Jew. He somehow managed to flee, with his attackers in hot pursuit. He hid, bruised and bleeding, in a fruit grove while they prowled about, trying to locate him and finish the job. Simultaneously other Arabs, in Jaffa – a hop and a skip from Bat Yam and downtown Tel Aviv – singled out Jewish stores to vandalize. They marked the windows of businesses not owned by Arabs, so that only Jewish property would be ransacked – not unlike what the Nazis did throughout Germany prior to undertaking the Final Solution. These weren’t isolated incidents. At the Nitzanei Oz Industrial Park in central Israel, which provides employment for Arabs from nearby towns, frenzied men burned four plants to a cinder. It behooves the leadership of Israel’s Arabs to remind its electorate that those who wish to enjoy the perks of Israeli citizenship cannot claim the liberty to abuse that citizenship in order to facilitate the brutal murder of fellow citizens and eventually destroy the state itself. Incendiary speechifying from Israeli-Arab public figures does a grave disservice foremost to their own communities. Reiterated lies trap ordinary folk in a vicious cycle of self-deception and self-imposed isolation. Disingenuous politicians confine their voters in a subjective counterfeit reality, which provides fertile ground for further incitement, violence and terror. The radicalization of the Israeli-Arab sector becomes a cynical vote-getting formula, and this is foremost that sector’s homemade tragedy. We have had this kind of garbage for as far as I can remember, and I have been here for a while now, more than half a century. We shall not choke on it, even when that kind of garbage is not recyclable. If Israel keeps treating the phenomenon with kid gloves, the problem is bound to persist. If Israel acts the way it did in 2000 on a consistent basis, at least it will not feel itself to be such a “friar”. But rather sadly, Jews continue to be scared of their own shadow. The government is busy with other more important and serious things than those who incite others towards violence,bloodshed and threats to kill Jews, namely chasing after Jewish children for graffiti crimes. What do you expect from the fearful secular cowards who have boxed themselves in by following after the lies of their gods ? They only have their little children to go after to show their gods how tough and brutal they are. By the way, TREASON should be dealt with, like what it is…a crime ! In the fall of 2000, after Arafat rejected Ehud Barak’s peace offers (which Barak claimed were “impossible to reject”) and tried to scare Israel with a wide military Arab coalition, there was an atmosphere in the media of Israel being weak and surrounded. 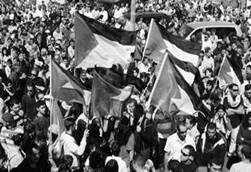 It was clearly visible that the Israeli Arabs simply did not want to be the last to reap the fruits of the “imminent collapse” of Israel, hence the October 2000 riots. And when they realized (with some help from the Police) that there will not be any “imminent collapse,” the riots had stopped. Now, and quite for some time, there is a “riot of the Arab elite,” – and the reason is the same! He came from a town in the magisterial district of Grodno, in White Russia, called Wolkewisk. He worked as a mechanic at a mill. One day there was a fair in the town & he came riding a horse cart, but, there were no horses. He had taken an engine from the mill & connected it to the cart. A Polish man said, ‘you are a clever Polish boy, under Russian rule, you will never get anywhere here, go to America’, which he did. He settled near Dearbourne & the rest is true history. I have not checked this out for its authenticity, but, it does make sense, he was a bigoted Roman Catholic, Anti Semite. This action is a repetition of all uneducated mobs throughout the uncivilized World. It does not take much to set fire to mob violence. The perpetrators here are our own voting citizens.